Sky Sports is using a research from University of Canterbury, a tool to predict the likely number of runs a team in score in first inning and the chances for team batting second to win. This tool is been used for limited overs cricket. This predictor goes by the term W.A.S.P (winning and score predictor). It is developed in University of Canterbury by PhD graduate Dr Scott Brooker and his supervisor Dr Seamus Hogan. 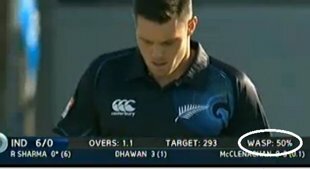 In the Indian-NZ, 50 over one day game today WASP’s % changed drastically as a wicket fell for India. 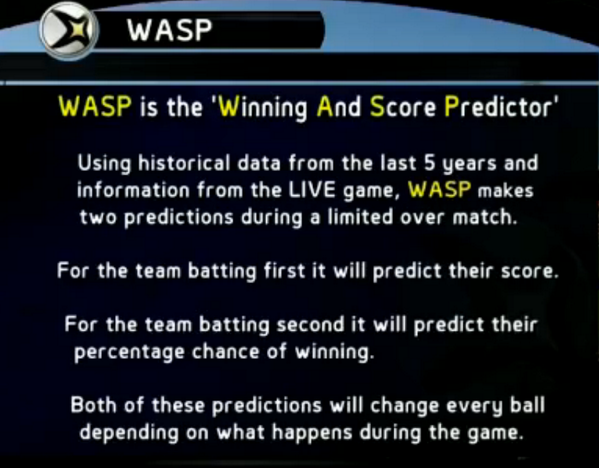 Warning: WASP is not to be used for betting as it is not a crystal ball view of which team is going to win. But it is a probability or estimate for the batting team. But WASP can screw up when: If a batsman retires hurt and may or may not return to the crease (This happened in Feb 2013 one day game between Eng v NZ when Guptill retired hurt and then returned at number 9 and took NZ to victory. So will IPL auctions be effected? Time will tell. Note: taken from various sites, and details accumulated. No copyright violation intended.